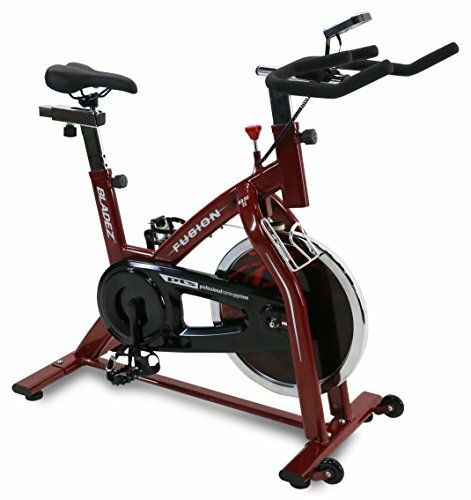 Take your indoor bike training and cardio workout to the next level with the newly designed Bladez Fitness Fusion GS II indoor cycle. Bladez Fitness by bh, a worldwide leading road bike manufacturer and company since 1909 improved an already top selling indoor cycle by upgrading; frame design, handlebar post and tem, dipped racing style handlebars, seat, water bottle holder, paint, graphics and more to help you reach your training and fitness goals. Features include; anatomically designed sports seat with Fore/aft and up/down adjustability, dipped racing style handlebars with up/down and Fore/aft adjustments, ultra smooth heavy weight 40 lb flywheel, oval tube heavy duty frame, top down resistance/emergency braking, 3-Piece pedal crank system for added durability, motivational LCD console displays time, speed, distance, total distance and calories with scan feature, sport pedals with toe basket, aluminum mounted water bottle holder, ball bearing transport wheels, leveling feet for uneven surfaces, racing style handlebars and much more. If you have any questions about this product by Bladez Fitness, contact us by completing and submitting the form below. If you are looking for a specif part number, please include it with your message.